My little princess is turning six in March. We had plans to have a sleepover but found out that her best friend was leaving school and moving to another town. Willow was so sad she wouldn't be able to come to her sleepover so we moved it forward so she could share her special event with her three best friends Brooke, Elsie and Atawhai. 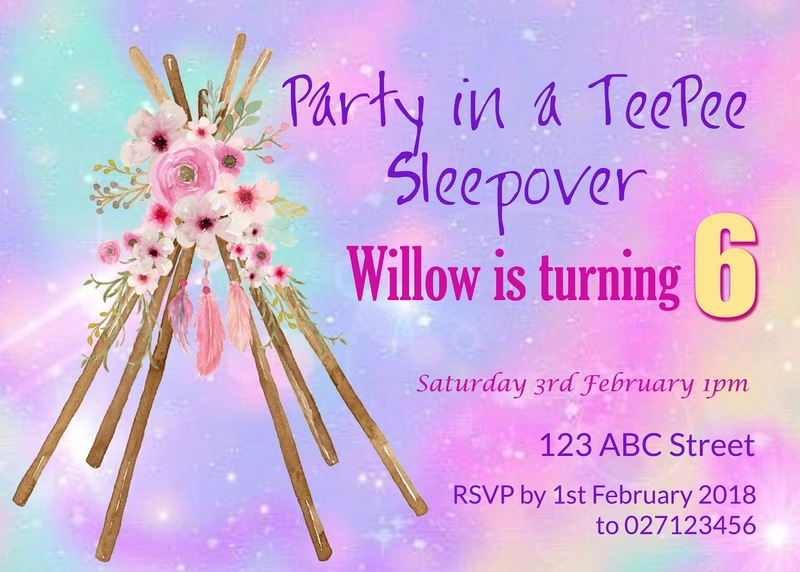 It was really short notice (three days) to pull off an amazing sleepover for Willow and her best friends so quickly made this invitation up quickly for the party. Anyone who follows my blog would know I love decorating but all the decorations I bought online didn't arrive in time since we moved the date forward six weeks. I don't think the girls noticed at all, there were so many treats for them all and they just loved that they could spent time together. We set up the spare room (which isn't very large) with the four tents I purchased from Cotton On Kids. They had originally been $45.00 each but at the end of season sale were $10.00. When I brought them online I also got another $10.00 off for being a first time purchaser to their site. We blew up four airbeds to go under each tents and covered with new fitted sheets and pillows. At the end of each bed was a little tray full of goodies for each of the girls. Each tray had a Pump Bottle of Water, Princess Puzzle Money Box Tin filled with biscuits, Mini M & Ms, Mini Packet of Skittles, Cupcake Surprise Doll (Toy), Best Friends Wrist Bands and Glow Sticks. As well as a tray of goodies each girl got a pair of PJs and a Mermaid Tail Blanket and a little Ice Cream Cushion. The girls played for ages outside doing chalk drawings, jumping on the Trampoline nd running around until afternoon tea. They came inside hungry for a treat or two. After afternoon tea we loaded up two cars and took them to the New Brighton Park that opened at Christmas. The girls played so well together, posing for a few photos together too. There was a busker at the park who had musical instruments to share so they joined in laughing and having great fun. Rob and Leroy went to get Pizzas for dinner and when they arrived back we all sat at a table for dinner. They girls had a great appetite eating lots of pizza, wedges and garlic bread. When we got back from the Beach Park in New Brighton the girls all wanted to dress up. Willow asked if they could borrow my makeup. They were giggling and putting on each others makeup. When they came out to parade around I had to stop myself laughing, but really they were gorgeous. Four little princesses all dressed up and ready to dance outside. For supper the girls really wanted to make Ice-cream sundaes. While I organised their this the girls cleaned off their makeup and got into their gorgeous matching Pyjamas. Ice-cream Sundaes went down a treat, and now they were all ready to start winding down. We played Pass the Parcel with a twist. Each layer had a task the girls had to do before opening the layer. Some of the tasks were Tell a Joke, Sing a Song with Actions, Say the Alphabet with a Marshmallow in your mouth and give each other a high five. Each layer had four gifts, one for each girl. Princess Craft Set, Bubbles, Princess Pencil, Stickers, Flying Unicorn Set, Lollies and more. All the girls were awake by 8.00am but so quiet siting out in the lounge watching TV. When I got up we all had breakfast and the girls went and played. They had competitions outside flying their Unicorns When the sun was hot enough I took them out the back to supervise them in the pool and sprinkler. We had a fantastic morning of fun again. Very hungry again after swimming all morning and running around. They all wanted McDonalds so I made my own chips and nuggets for them. They thought it was so much better.